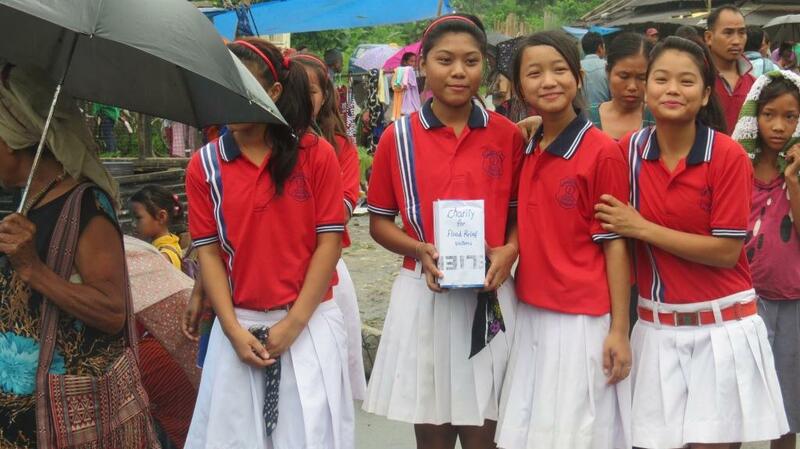 A group of young students from Newman School in Neotan village of Changlang District in Arunachal Pradesh raised funds to help the victims of flood in eastern part of Arunachal Pradesh on 27 July 2016. Incessant rains over the past two weeks have wrecked normal life in most part of Arunachal Pradesh, especially in Changlang, Lohit and Nasmai Districts. Thousands have been rendered homeless and a huge volume of loss of property and livelihood has been reported from across these three districts. In a noble step to respond to the victims of this recent flood, a group of students from Newman School organized a fund raising drive at Namphai I Bazar area. The team led by Salem Chithan and Barsha Thapa, both tenth graders, drew the attention of the bystanders and all at the Wednesday Bazaar at Namphai I with an impromptu jig. The bazaar came to a standstill with the dances by the students. Fr. Felix Anthony explained to all the reason why the students were there at the market. “Normal life has been paralyzed and many have lost their homes and livelihood and hundreds of people are left without food and homes. The students are here in your midst to be a medium between you and the people who need you.” He asked all at the market to be generous in their contribution to help the victims of this flood in east Arunachal Pradesh. He also congratulated the students for their initiative to express their solidarity with the victims of recent flood. “You have learned today the joy of giving and the world will be better place to live in if all learned to give and share”, he said. Namphai I is a main junction that connects Miao with Assam and it being a market-day today, the students chose this day for their collection drive. The people who came to buy vegetables spared a 10 rupee for the victims of flood. The students were very happy that they could raise a collection of Rs. 4576. They also collected cloth and provisions from the students themselves and also collected cloths from the students of ITI Balinong. Thanks to Mr. Lincon, the Principal of the ITI, for making the collection possible. The proceeds were forwarded to Seva Kendra Arunachal East, which has been providing relief materials to the victims in Changlang District, especially in Diyun circle, the most affected area.